Garment workers in Haiti, whose minimum wage is only $2.50 a day. 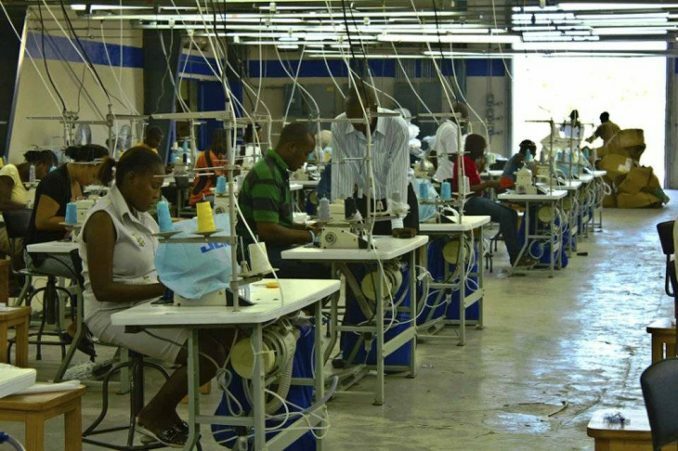 Inflation is a cruel blow in Haiti, where the per capita income is $350 a year ($409 in urban areas), and the daily minimum wage is only $2.50 for workers in the textile industry. Workers throughout Haiti know that life is getting harder, and it’s difficult just to feed themselves and their kids. On May Day, workers organized a panopoly of protests throughout the country: marches, conferences, sit-ins and town-hall-style meetings. 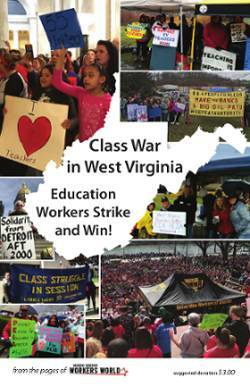 They not only demanded an increase in the daily minimum wage to $15, but brought up vital issues that must be addressed — transportation, social security, flagrant corruption, and the dignity and rights of women. Unions held a big march to Champ de Mars in the heart of Port-au-Prince, the capital city, where the government was holding a festival of “labor and agriculture.” Festivals honoring workers were organized in many locations, especially in Jacmel, where it has become a tradition. On the road to Pétionville, the Autonomous Center of Haitian Workers organized a symposium on the critical issues of social security and social protections. A coalition of labor unions, farmers’ associations, religious youth and others marched for two hours through Ouanaminthe, a major city on the Dominican border. Stopping at every public office and institution, they loudly demanded an increase in the minimum wage and improvements in social security, health care and transportation. Only a small proportion of Haitian workers have a steady job. Their unions took to the streets on May 1 to support the needs of all workers in Haiti. The organizing spilled over into Flag Day, May 18, when unions marched with their own demands, despite the government’s promotion of patriotic fervor. Two significant incidents marked the previous week. In Cap Haitien, Haiti’s second-largest city, someone set off tear gas during a “conference/debate” over corruption at the Café Trio Cultural Center. One person died and many were injured in the crush to avoid asphyxiation. In Bleck, a small town in the far southeast, 14 cops showed up with a local landlord to kick farmers off land they and their ancestors had lived on for 200 years. A brawl broke out after a young boy was killed. The cops had to flee when the people seized their weapons and burned their cars. U.S. interference in Haiti’s internal affairs started before it gained independence from French colonialism in 1804. Under orders of President George Washington, the U.S. delivered “foreign aid” to the slave masters attempting to crush the Haitian Revolution. After the people’s victory, President Thomas Jefferson imposed a blockade on Haiti that lasted until 1862 — when the U.S. finally recognized the nation. U.S. Marines later occupied Haiti from 1915 to 1934. U.S. interference didn’t leave with the Marines. In 2011, WikiLeaks and Haïti Liberté exposed how intensely the U.S. manipulated Haiti’s internal affairs in 2009, when the Haitian Parliament unanimously passed a bill raising the daily minimum wage to $5. This caused great consternation among U.S. corporations like the Gap, Disney and Old Navy and companies from Hong Kong, South Korea and Macao, which had invested in Haiti’s garment industry to supply U.S. brands. Under the direction of then Secretary of State Hillary Clinton, the U.S. State Department quickly and aggressively pressured the Haitian government to lower textile workers’ daily minimum wages to $2.50. This year’s May Day activism showed that the Haitian people continue to oppose U.S. imperialism’s interference in their political and economic affairs, as they demand a living wage and other improvements in their standard of living.